Ugh, OK, so last night I endured some kind of terrible food-poisoning event. This morning the first thing I saw was that horrible picture of Michele Bachmann, and it basically started my body's involuntary purge cycle all over again, so I've got to push it down the page a little bit. Blecccch. Speaking of Bachmann, Newsweek's cover story is now up for your reading... pleasure? It's not very pleasurable at all, truth be told, because it is so basic, like it's intended for people who have never heard of Bachmann. The author, Lois Romano, mentions controversies without describing them, and it's just Tea Party Tea Party blah blah blah. The article features no insights, no analysis, nothing new or noteworthy at all. I believe the cover photo says much more about Michele than the actual story it purports to represent, like the former wrote a check the latter was too embarrassed to cash. Too bad. 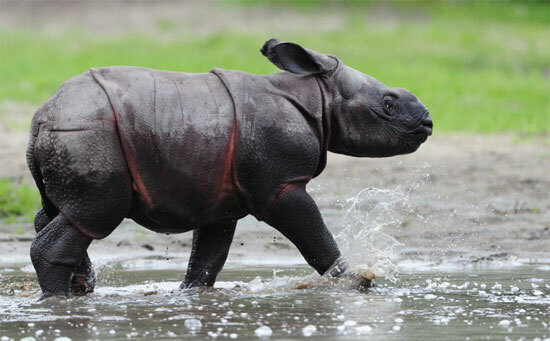 Cute baby rhino, though, right? UPDATE: The New Yorker has a much, much better Bachmann profile up today. This one is everything the Newsweek story should be, but isn't. Are those red stripes chafing? That looks like it could be painful for the little tyke. Even so, much less painful than the Michele Bachmann picture. Moving it down the page. You were right about the New Yorker piece, very good stuff. I'm not surprised they got immersed in the crazy end of Christianity, but I couldn't believe Marcus was completely unaware of the phrase "silver fox", thinking it was gay. He'd never heard of Charlie Rich? Now that's a sheltered life. Thank you for the rhino baby.Cuteness in the AM is always good. Item on HuffPo today about how upset right wingers are about the Michele cover. "It makes her look crazy!" Um, what am I missing here? "Shoot! Aim! Score!" I love it :) Great New Yorker piece indeed! Pete, this ought to put a spring in your step! Callista? check! Real food? check! Ugly bus? check! JakeInDK: that is a true trifecta photo. It reminds me of a song from my schoolboy days: 'He loves to put his Oscar Meyer in 'er....' and so forth. Well, yes, Jake, that is just exactly the type of thing I'd post here. But now you've scooped me in the comment section of my own blog, so you've spoiled it, and now I can't use it. In the future, please feel free to email me tips. "That didn’t mean that I woke and all of a sudden I had money, all of a sudden I had position, all of a sudden I had education. It didn’t. But what it meant was that all of a sudden I had a father." That's really quite sad. She traded a distant, imperfect, but flesh-and-blood father for a completely imaginary one, who was perfect in every impossible way, who would always love her, and who would never leave her, because he only existed in her faith. Wow, I just realized that Halloween is practically around the corner. Does anyone know where I can get a Callista wig? I'm in the Washington, D.C. area. If not Callista, there's always Bachmann. But I'd prefer Callista. More bling opportunities.